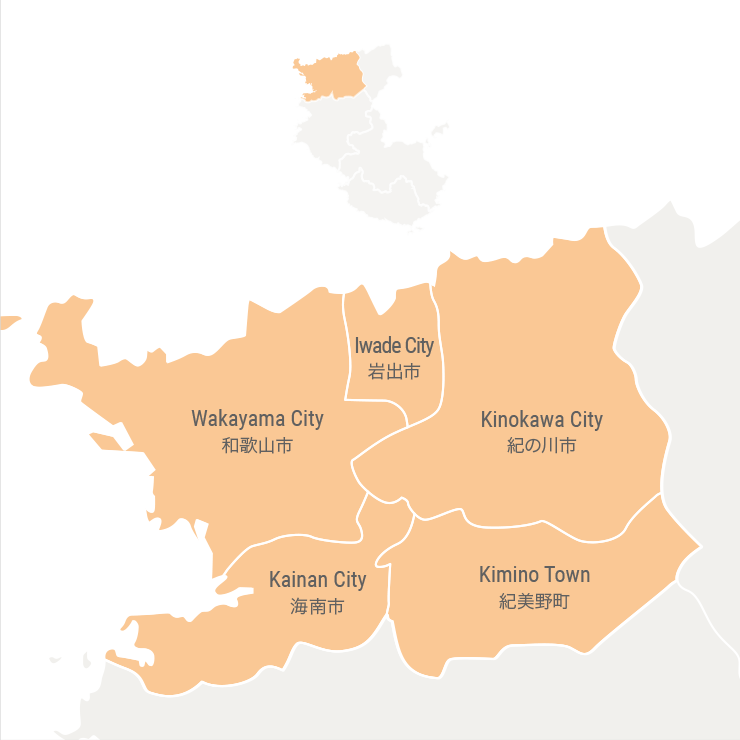 To understand a name, is to understand history; the name Wakayama references the scenic Wakaura bay nearby, and Okayama, the former name and site of Wakayama Castle. The last in a series of feudal rulers of Japan was the Tokugawa family. They re-united Japan in 1603, after centuries of civil war, ushering in an era of 265 years of peace in Japan. During Edo period rule (1603 - 1868), Japan’s economy and culture flourished. A cadet branch of the Tokugawa House was made lords of what is now Wakayama Prefecture, building Wakayama Castle. The 8th Tokugawa shogun, Tokugawa Yoshimune (1684 - 1751), who was a native son of Kishu Domain (modern-day Wakayama), ruled Japan from 1716 to 1751, and is considered one of the greatest of the Tokugawa Shoguns, presiding over many important reforms. Echoes of the feudal period remain throughout Wakayama, be it a traditional inn at Ryujin Onsen built by order of the lords of Wakayama that still operates, or to the maintenance of the famed Kii Mountain pilgrimage routes. Controlling this region – the southern-most tip of Japan's main island of Honshu – was a top priority, and Wakayama Castle was therefore the most important fortress protecting western Japan. Dominating both the surrounding land and ocean, this landmark site is a reminder of the city’s history as a prosperous, and strategic site during feudal times. Just as it was then, it continues to be a favorite spot to enjoy the cherry blossoms in Spring, and the tapestry of colored leaves in Autumn. As a city chosen for its strategic geographic location, panoramic vistas are part of Wakayama's DNA. Some of the best views of the city, and out over Wakaura Bay can be had from the keep of Wakayama Castle, the Tosho-gu Shrine, and from Kimii-dera Temple (located on Nagusa-yama mountain). Kimii-dera Temple is where the first cherry trees flower every year in Kansai. With more than 600 km of coastline, seafood is a quintessential part of Wakayama’s cuisine. Local varieties include whitebait (shirasu) and seabream (tai), particularly in autumn, but expect to see other regional fare from across the prefecture. Avoid disappointment by keeping in mind the Japanese ethos to enjoy food when it is ultimately delicious, and therefore available in season. If you have a weakness for fresh tuna, then look no further; Wakayama prefecture offers western Japan’s premiere catches. Here you will enjoy this deep sea delight before it ever sees the inside of a freezer. And, unlike anywhere else on the Japanese archipelago, visitors can watch skilled fishmongers expertly showcase how to carve tuna here. Experience one of the many delicacies that originates from Wakayama prefecture, thought to be one of the earliest forms of sushi. These rustic rice balls are wrapped in nature’s readymade preservative and to-go packaging: persimmon leaves (kaki no ha zushi) or pickled mustard leaves (mehari-zushi). No matter the time of year, a soulful bowl of the prefecture's best known noodle dish can always be found. Wakayama Ramen – though locals refer to it as Chinese noodles (chuka-soba) – has garnered nationwide fame. This soupy delight gets its signature taste from a rich, pork broth flavored with none other than a Wakayama original in Japan - soy sauce! No experience could be closer to the notion of ‘farm to table’ than handpicking your own produce. Experience rural life, and get back to nature at one of the many fruit orchards in Wakayama. And if you have ever been curious about the perfection of Japanese fruit in terms of shape, color and taste, this is the spot to find out. Many offer an "all you can eat while you pick" option for a reasonable price.